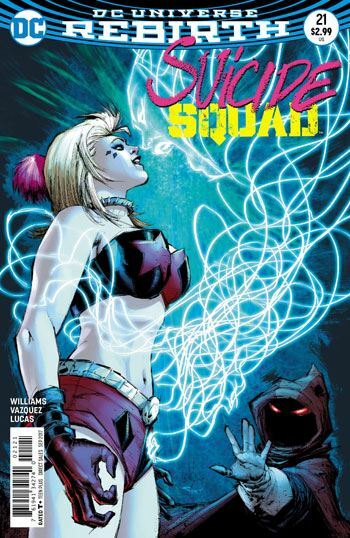 Suicide Squad 21 features the team’s first mission with Harley Quinn as their field commander. Amanda Waller sends the Squad after Direktor Karla, the leader of the People, who have been a menace to the team for most of this run. At the same time, Waller is called before Congress to testify about the events in the Justice League vs Suicide Squad miniseries. Sadly, neither of the two threads in this story quite lives up to expectations. Harley Quinn acts pretty much like Rick Flag did in her leadership role. There is little to no trace of her distinctive craziness, aside from her appearance. Sure, towards the end of the story she takes some actions that, on the surface, appear chaotic and strange. But it doesn’t take a lot of thought to understand the rational motivations behind them. Thankfully Enchantess and Croc are there to provide some comic insanity. Even Deadshot gets some funny lines. Cosmonut, on the other hand, is given the ability to speak properly. I agree with Harley’s comment, I preferred him when he couldn’t talk. As for Amanda Waller, she seems off her game as well. I have been bitching and moaning about the lack of political commentary in this book, and now here we have a Congressional testimony scene. Amanda Waller lies so compulsively, you would swear she was White House staff. And yet, is there any trace of that? Anything that reflects the current mass of lies and deceit that pervades US politics? No, it’s all fairly standard, with no bite. At the very least I expected to see a black Congresswoman getting repeatedly interrupted by white men. Williams is definitely not on par with this issue. Fortunately Gus Vasquez does a really solid job with the art, particularly in the action scenes on the mission. Gotta love what happens with the airplane. So even if this is a disappointing read, it’s easy on the eyes.